Abel Design Group recently completed the relocation of the King & Spalding Austin office. The completion of this project marks the fifth King & Spalding project designed by Abel Design Group Principal Ken Harry. Celebrating more than 130 years of service, King & Spalding is an international law firm that represents a broad array of clients, including half of the Fortune Global 100, with 900 lawyers in 18 offices in the United States, Europe, the Middle East, and Asia. The Austin office provides legal services primarily in the areas of energy, natural resources, and litigation. It is composed of approximately 50 lawyers in 27,000 square feet of space. The managing partner requested a traditional Texas Hill Country feel for the new office. The design team researched and incorporated indigenous materials such as Hill Country stone and American Walnut into the design. The space also features a technology-rich conference center with configurable rooms, a serving galley, glass-front offices, an unenclosed coffee bar with community table, LPA teaming pods, and more, all achieved for fewer than 550 net rentable square feet per lawyer. 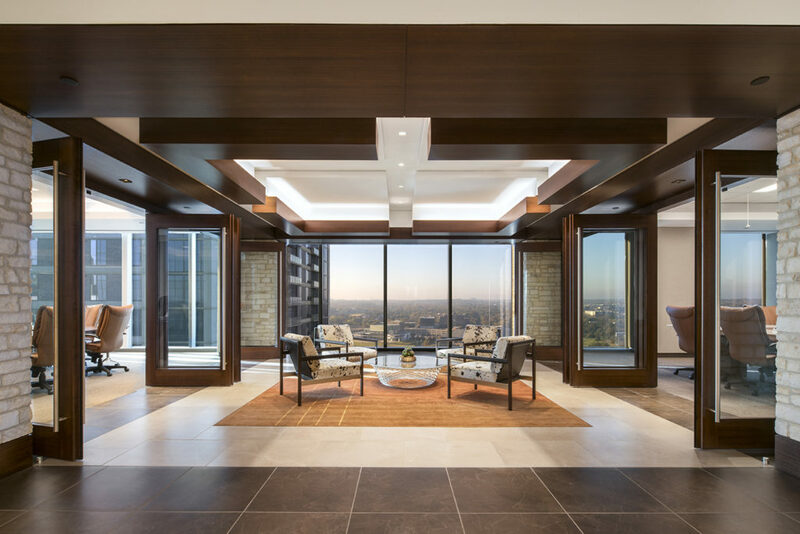 Founded in Houston, Texas in 2001, Abel Design Group is a premiere architecture and interior design firm specializing in corporate, hospitality, higher education, restaurant, and retail design, nationally and internationally. Abel Design Group received several 2016 award wins – Interior Design Magazine Rising Giants for the sixth consecutive year, the Houston Business Journal Fast 100 for the fourth consecutive year, the Houston Business Journal Best Places to Work for the second consecutive year, and the American Institute of Architects 2016 Interior Design Award.